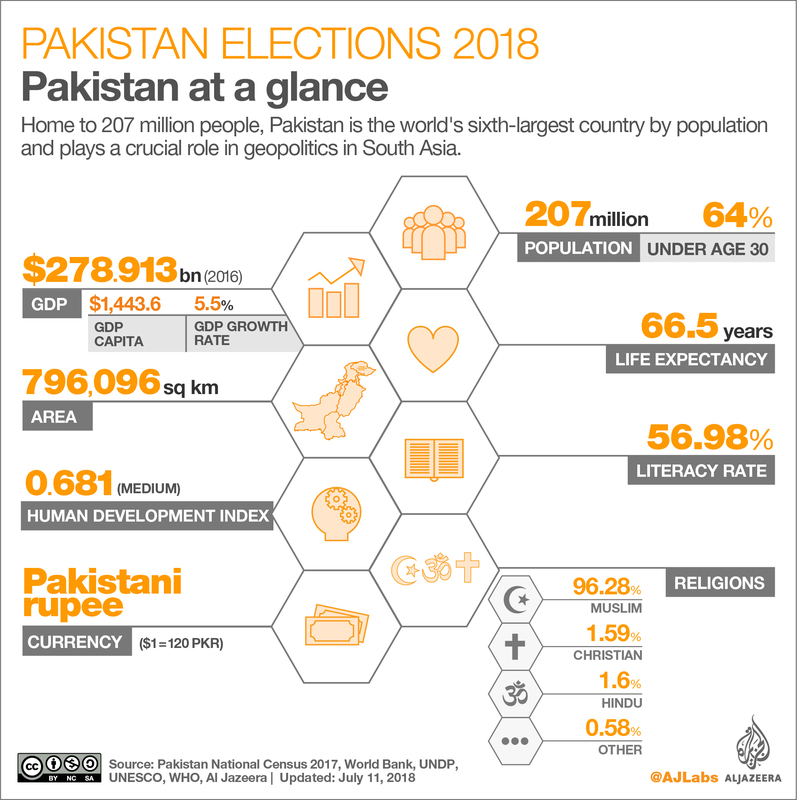 Islamabad, Pakistan – Pakistan is preparing to vote in its next prime minister. No prime minister in the country’s history has ever completed a full five-year term in office. If this election goes smoothly, it will be the second civilian to civilian handover of power after a full term. The first was in 2013. Wednesday, July 25. Polling begins at 8am (05:00 GMT) and closes at 6pm. 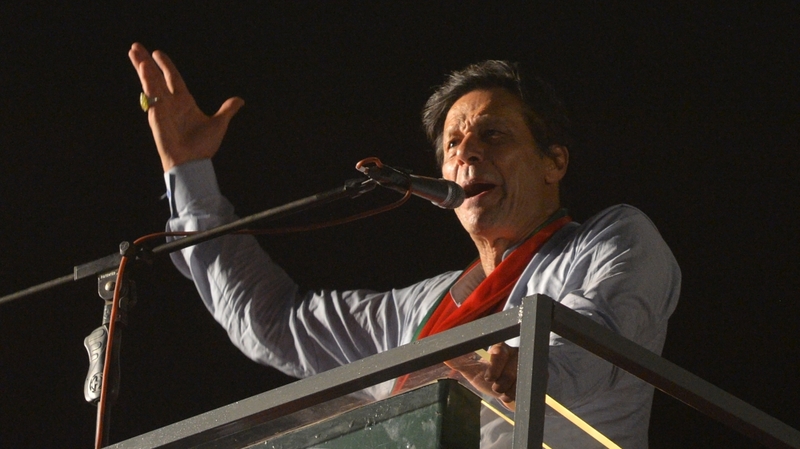 In the four provinces and at the centre, the fight will mainly be between the incumbent Pakistan Muslim League-Nawaz (PML-N) party, led by Nawaz Sharif, and the opposition Pakistan Tehreek-e-Insaf (PTI), led by cricketer-turned-politician Imran Khan. The Pakistan Peoples Party (PPP), led by Bilawal Bhutto Zardari, is also expected to pick up seats across the country, as is the Muttahida Majlis-e-Amal (MMA), an alliance of right-wing religious parties. When will the results be known? Preliminary results should begin to trickle in by around 8pm, and we should have a good idea of overall results by around 2am. 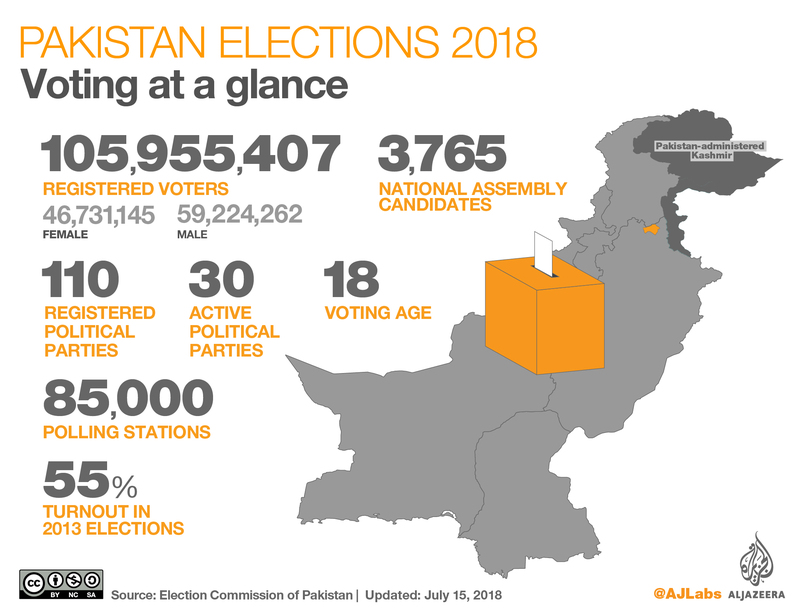 More than 105 million eligible voters can cast their ballots for two seats in each constituency: one for the National Assembly (the lower house of the federal parliament) and one for their Provincial Assembly (which runs their provincial government). Pakistan has four provinces: Sindh, Balochistan, Punjab and Khyber Pakhtunkhwa. In total, there 272 directly elected and 70 reserved National Assembly seats up for grabs across the country. A single party will need to bag at least 137 of the directly elected seats to be able to form the government on its own. What’s at stake this year? Last July, then-Pakistani Prime Minister Nawaz Sharif was dismissed from office having falsely filled out a parliamentary wealth declaration. On July 6, he was convicted by an anti-corruption court. He and his daughter Maryam have now been jailed. The opposition PTI, meanwhile, sees an opportunity to be voted into power for the first time and promises to eliminate corruption and address socioeconomic issues. 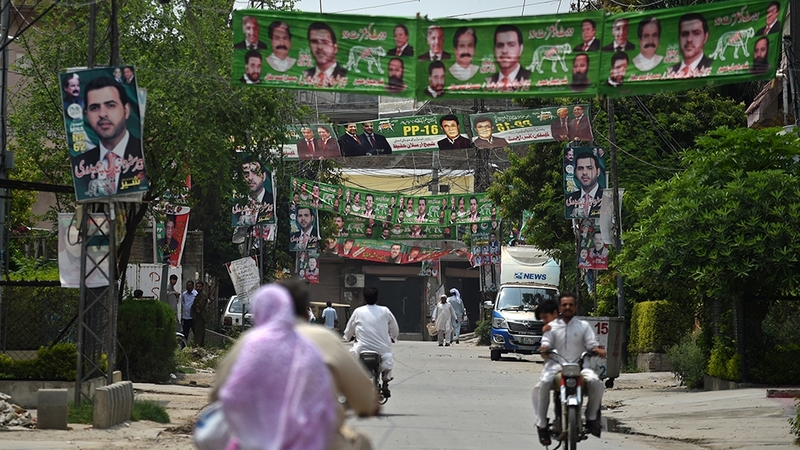 The incumbent PML-N is expected to lose ground to the PTI in Punjab province, its political heartland, where more than half of the 272 directly elected seats are located. Many PML-N candidates switched loyalties before the polls, either joining the PTI or running as independents. In Sindh province, the PPP is expected to hold on to its rural base, but there will be an interesting fight for the 21 seats in Karachi, the provincial capital and the country’s largest city. After a paramilitary operation targeted the dominant MQM party, the city is seen as politically open for the first time in more than 30 years. In northwestern Khyber Pakhtunkhwa province, the MMA religious alliance has made a bid to replace the PTI after its five years in power there. In Balochistan, the country’s largest but least populated province, the newly launched Balochistan Awami Party is expected to do well after having led a revolt against the PML-N’s government earlier this year. But opponents allege the party is backed by the military, and say its win in the province is being “engineered”. Violence and an unfair election. On July 13, more than 149 people were killed in an attack on a political rally in the southwestern district of Mastung, bringing the total toll from election-related violence in the run-up to the polls to more than 170. The military has deployed more than 370,000 troops to ensure security on polling day, but there are fears of further attacks. There are concerns that the vote will not be free or fair (more on this below), with several parties alleging the military has been tipping the scales ahead of the election. This vote has also seen a rise of far-right parties participating, including at least two that are considered political fronts for the Lashkar-e-Taiba and Lashkar-e-Jhangvi armed groups. Will the vote be free and fair? The PML-N alleges that its candidates and supporters have been urged to switch loyalties by people identifying themselves as intelligence or military officers across the country. On July 16, the Human Rights Commission of Pakistan (HRCP) said it was “gravely concerned” over what it sees as unabashed attempts to manipulate the outcome. The elections will be observed by both national observers – notably the Free and Fair Elections Network, or FAFEN, and by international missions from the European Union, the Commonwealth and elsewhere. How might this election impact foreign policy? Pakistan’s foreign policy, particularly its strategic relationships with the United States, China and Afghanistan and its fraught relations with regional rival India, is largely seen to be in the hands of the military, and so no major changes will be expected on those fronts.